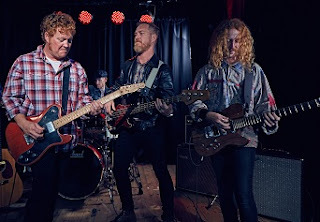 Let the Black Lapels (Rob Warren, Garth Warren, Gareth Gale and Luke Wyngaard) transport you back to the late 60’s and early 70’s by performing their musical tribute to the Creedence Clearwater Revival Band. The show runs from March 16 to 18 at Rhumbelow Theatre Durban’s temporary location, St Cyprians Church Hall. Back by popular demand, the CCR show allows the Black Lapels to crank up the amps and head full-tilt into this not to be missed performance! The set list includes all your favourite hits including, Fortunate Son, Looking out my Back Door, Down on the Corner, Up around the Bend, Born on the Bayou, Green River and many more. Highlights of the show include intimate renditions of CCR classics like Lodi performed solo by Lapels front man Rob Warren. The Lapels rhythm section featuring Garth Warren (bass) and Gareth Gale (drums) keep the set moving along at an energetic pace and Rusty Red (lead guitar) reproduces CCR guitar lines with minimum effort! With an astounding 26 million plus record sales cred behind them, CCR established themselves as an iconic Rock Royalty brand alongside other giants at the time like Hendrix and the Stones, producing commercial billboard masters - Bad Moon Rising to obscure socially-conscious underground pieces like Suzy Q. With such iconography, John and Tom Forgery together with Doug Clifford and Stu Cook continued to embed a DNA up until the mid-70s, with such remarkable recall that, to this day, they remain part of a fabric that will continue to influence cultures decades from now. Bring your sons and daughters if you can. Shows take place on March 16 and 17 at 20h00 and on March 18 at 14h00. The venue opens 90 minutes before show for picnic dinner. Tickets R150 (R130 pensioners and tables of eight or more). Take along food picnic baskets. Braais will be available. There is limited secure parking and booking is essential. A cash bar is available (no alcohol may be brought on to the premises). St Cyprians Church Hall is situated at 603 Umbilo Road, Glenwood, Durban.